“To provide professional and accessible healthcare in a friendly and compassionate manner”. Dr. Arno Koegler (1898-1993) of Germany was a veteran of World War I. He was seriously injured in the War and spent three years mostly in bed after his injury. Finally, he went to see a Dr. Felke, a well known healer/naturopath, who restored him back to health. This experience led Dr. Koegler to study with Dr. Felke and become a natural healer/naturopath himself. 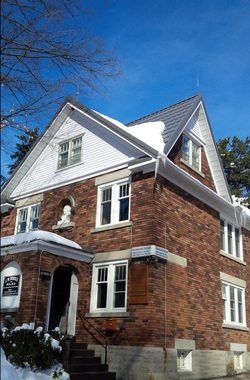 In 1927, Dr. Koegler moved to Canada where he started his own clinic in 1929 on McDougall Road in Waterloo. He was the first naturopath in Waterloo and one of the first in Ontario. There were many challenges for the young doctor. At that point in history, naturopathic medicine was not a recognized profession, and Dr. Koegler was charged with “practicing medicine without a license” and “practicing medicine with the hope of a reward” by the provincial medical inspector. Dr. Koegler was treating many prominent people at the time, including the wife of the mayor of Waterloo. The mayor in court chastised the medical inspector who brought the charges and told him “you should be ashamed to show your face here, charging someone who is helping people!" (Dr. Koegler had treated his wife successfully when the conventional doctors had told her there was no hope of recovery). In fact, the judge at one point said “ I have to charge you under the law as it is, but I will pay the court fees out of my own pocket!" This of course, created quite a sensation and Dr. Koegler became even more popular. At his retirement after 50 years of practice it is estimated he had treated 250,000 people in his career. Ultimately, naturopathic medicine became a self-regulated profession through the Ontario Ministry of Health under the Drugless Practitioners Act, and it is now regulated under the Regulated Health Professions Act (RHPA). Dr. Koegler began manufacturing his own homeopathic remedies due to the difficulties of importing them from Europe. He also developed his own unique manufacturing machines and developed and manufactured a general purpose ointment, cold tablets, and nerve tablets. In 1979, Dr. Koegler retired and Dr. John Bender succeeded him and continues the clinic's tradition of healing, utilizing many of Dr. Koegler’s methods while incorporating many of his own.